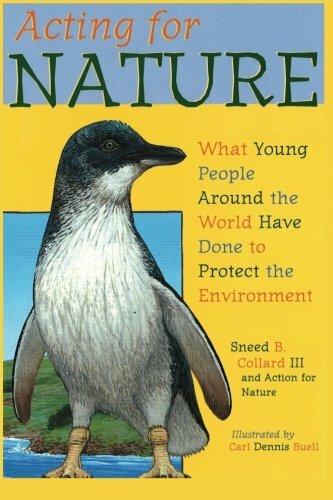 Young people age 8 - 16 can make a difference in our environment! Start here to prepare yourself for an Action For Nature Eco-Hero award. First of all, you, yourself, can start to make a difference! Read our book Acting for Nature describing real-life stories about young people like you who made a difference. They saw an environmental problem in their neighborhood and single-handedly or with the help of friends succeeded in fixing it. Go to libraries and museums or onto other nature-friendly websites for useful information on how to protect the environment. While on our website, read our suggestions to help you protect the environment. Learn about other eco-friendly organizations and websites by going to our resources section. Ask family, friends, teachers and youth leaders for help. THEN IT’S UP TO YOU TO ACT! If you and your friends see an environmental problem in your neighborhood that needs fixing, don’t wait for someone else to fix it - that might never happen without your personal action. You have the power within yourself to help make the Earth a better place to live.